Back in the the '70s and '80s many members of the NZ Socialist Unity Party trained at Lenin's Institute for Higher Learning (aka the Institite of Social Sciences)in Moscow. Several thousand students from virtually every nation on the planet were trained in Soviet revolutionary tactics and strategy. The Soviets categorised and prioritised countries according to their importance to long range communist strategy. New Zealanders may be surprised to know that our little nation was Category Two-up there with India, no less. Category One countries (the most important) were Great Britain, Chile, Argentina and South Africa. As Cape Horn and the Cape of Good Hope are two of the planet's great strategic choke points, it is easy to see why Chile, Argentina and South Africa (now all under socialist/communist control) were considered so important. Firmly under Communist Party control, South Africa is now destined to play a huge role in the rapidly expanding, Russia/China/Communist/Islamic, anti-Western alliance. Russian President Putin visited South Africa last year. Now Chinese leader Hu Jintao is paying his respects. 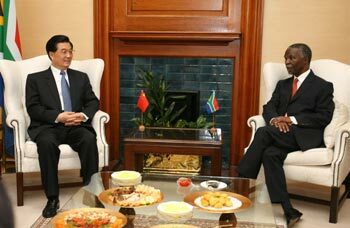 Johannesburg, Feb 6 China and South Africa decided on Tuesday to raise their bilateral relations to the highest level, after a meeting between Chinese President Hu Jintao and his South African counterpart, Thabo Mbeki, during the Chinese president´s two-day visit to South Africa. The heads of State regarded their alliance as strategic, and Mbeki told press the relation is "an important advantage for South Africa facing global challenges," after their first day of work together in Pretoria. PRETORIA, Feb. 6 China and South Africa issued a joint communique on Tuesday laying out a variety of priorities for the two countries to strengthen bilateral cooperation in such areas as politics, economy and trade, international affairs and people-to-people interactions. The communique stated that China and South Africa will develop their relations along the lines of the four principles agreed upon by the top leaders of the two countries. The four principles are: political mutual trust and strategic consultation between the two countries should be broadened; economic cooperation and trade should be enhanced; coordination and cooperation should be enhanced through diplomatic consultations; and cultural and people-to-people interaction should be strengthened. The Chinese side will make use of the China-Africa Development Fund to encourage Chinese companies to invest in South Africa. South Africa will encourage Chinese companies to take up the investment opportunities that its growing economy and favorable investment environment offer. China will provide concrete support as well as requisite resources to cooperate with South Africa in human resources development, poverty eradication, employment, rural development and the creation of infrastructure. Maintain communication and collaboration in the United Nations, the World Trade Organization and other international organizations, and fully coordinate each other's positions on major issues such as development and poverty reduction, regional conflicts, South-South cooperation and North-South dialogue and formulation of multilateral trade rules. The two countries will cooperate in promoting a new type of strategic partnership between China and Africa under the guidance of the Declaration of the Beijing Summit of the Forum on China-Africa Cooperation and the Forum on China-Africa Cooperation-Beijing Action Plan. In the communique, South Africa reaffirmed its commitment to the one China policy, recognizing the government of the People's Republic of China as "the sole legitimate government representing the whole of China" and that Taiwan is "an inalienable part of the Chinese territory." South Africa is the sixth leg of Hu's current eight-nation African tour, which has already taken him to Cameroon, Liberia, Sudan, Zambia and Namibia. He will also visit Mozambique and Seychelles. Looks like China certainly wants to turn South Africa into Zimbabwe. I wouldn't be buying a farm in South Africa in the near future MAH. China is also using Zambia as an "economic zone" literally turning it into its colony just like Zimbabwe. South Africa is a treasurehouse of mineral wealth. It is no suprise at all that China is agressively pursuing dialogue with SA.